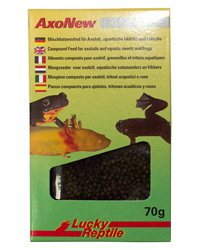 Axonew is a pelleted food suitable for axolotl and other aquatic newts and frogs. Some pellets will sink immediately, while others will float initially before finally sinking. The extended sinking over a period of time will stimulate the hunting instincts of the axolotl, and allows food to be available for eating over a longer period of time.